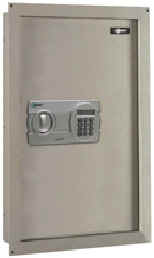 We have a wide variety of safes available for your every need. Whether it be for your business applications, or for your home use. Commercial duty burglary and fire rated safe. Smaller size20¼X17¼X18¾. 2,340 cubic inches. Same commercial duty as BF1512. Larger size 26¼X21¾X20¼. 5,024 cubic inches. Largest of the BF Series. 39¼X21¾X21¾. 8,976 cubic inches. Quick comparison of our standard commercial duty safe sizes. Top drop safe for retail business. 20X14X14 outside dimensions. 1,739 cubic inches. Front drop safe for retail business. Convenient front drop door for installation under a counter. (Model # change to CSC1913) Affordable series with burglary and fire rating. Includes electronic lock. Smallest size available. 19.5"X18"X19.9". (Model # change to CSC3018) Affordable series with burglary and fire rating. Includes electronic lock. Medium size 35.5"X23.5"X24". (Model # change to CSC4520) The largest of the CSC series. 50.5"X25.5"X28.9". Burglary and fire rated. Includes electronic lock. Recommended! Affordable series with burglary and fire rating. Includes electronic lock. Available in three sizes. All on one page for comparison. 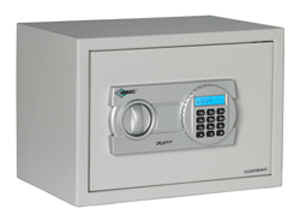 Fire rated safe excellent for protecting important home documents. (Model change to #WES2114) Burglary resistant safe mounts inside your wall for concealed security. Electronic keypad lock.